Archaeologists discover shell rings created by humans more than 4,000 years ago on Pockoy Island, but they must race against time to excavate as the Atlantic rises to claim these treasures. Satellite imagery. It's an amazing technology, really. In 1959, Explorer 6 captured the first images of Earth from space, and in just a few years the first operational weather satellites were up and running. Then, laser imagery came on the scene, allowing planes and helicopters to measure and outline objects below. Together, these technologies have merged and emerged as the truth-tellers and time capsules of our era. Are there hurricanes forming in the Atlantic? What is that circular object in the forest below? Where do most people live? The answers are now at our fingertips. We're also able to harness aerial images to travel forward or backward in time. Where will the Atlantic shoreline be one hundred years from now? Where was it a million years ago? The clues are there for those who have a discerning eye. This technology proved highly useful to emergency responders and an array of scientists during the aftermath of Hurricane Matthew. While reviewing high-resolution maps produced by aerial light detection and ranging imagery (LIDAR), analysts took note of two circular features on a remote shoreline of Pockoy Island, part of Botany Bay Heritage Preserve in Charleston County. The illuminated images appeared to be remnants of Native American shell rings, and this immediately garnered the attention of the archaeological community. Through years of study, archaeologists have become quite familiar with the somewhat-mysterious shell middens along the southeastern coastline and the historical records buried within them. Their catalogued excavations have painted fragmented pictures of the hunter-gatherer societies who inhabited the coastal region during the Late Archaic period - between 5,000 to 3,000 years ago. Within many of the doughnut-shaped shell deposits, the native groups left behind remnants of pottery and animal bone, some of which was ornately decorated. In South Carolina, the rings range in size from one to five meters tall and can be as wide as 160 meters across. The average is sixty-four meters in diameter. 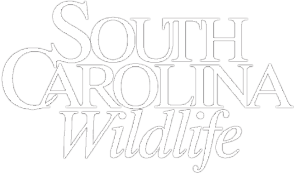 There are more than fifty shell rings in the Southeast, and more than two dozen of them are right here in South Carolina. The LIDAR images also revealed that the Pockoy Island shell rings were in imminent danger of being swallowed by the Atlantic Ocean. The SCDNR archaeology team joined forces with shell ring experts from across the Southeast to begin fieldwork in June 2017. Through shovel testing, systematic probing and excavating a sample area of the shell ring, the team successfully recovered animal bone artifacts necessary for radiocarbon dating. The results were conclusive: The circular formation was created by Native Americans more than 4,000 years ago. Over time, and at an increasing rate during modern history, the eastern shoreline has been incrementally washed away by the Atlantic Ocean due to a rise in sea level and storm activity. Hurricane Matthew and recent King Tides compounded erosion at Pockoy Island. The shell rings of Pockoy would likely be lost to the Atlantic in the foreseeable future - joining countless other historic sites engulfed by the ocean each year. The archaeology team was well-aware that the Atlantic had no intention of giving up its grasp on this seaside treasure. And so, a battle against time and the elements ensued. 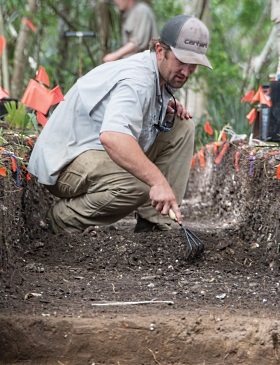 From December 2017 to current day, SCDNR Heritage Trust archaeologists and their cohorts have mobilized their office operations between work stations at Pockoy Island and their official headquarters. Dressed for the maritime site location, a sizeable number of archaeologists, student interns and volunteers painstakingly shave layers of earth in precisely marked squares. SCDNR archaeologist Meg Gaillard logs bags of artifacts, one after the other, at a makeshift desk positioned next to the excavated trenches. Periodically, she photographs the completion of an excavated level within a metric square, documenting the process. "A trench is excavated through part of the shell ring, one square block at a time," Gaillard explains. "At Pockoy, the trench measures twenty-one meters in length. Excavations are conducted ten centimeters at a time in one-by-one meter blocks. When excavating, a laser level is used to find the depth of each ten centimeter excavation context. Nails are hammered into the sides of the trenches to mark the level or depth as dirt is excavated. These points are marked so that everyone knows what depth they're at." Next, the excavated soil and remnants are placed on a sifting screen to segment artifacts. "Artifacts are bagged on site," Gaillard says. 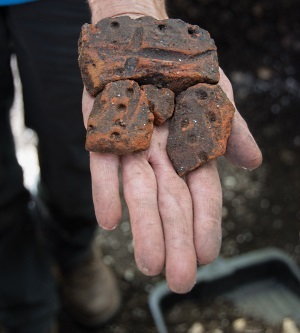 "Each bag has lots of contextual information, including: the archaeological site number, site name, quadrant, context, date, description of artifacts in the bag, and finally the initials of the people who excavated the unit and sifted the dirt. A sequential bag number is added in the field before each bag is packed to transport to the laboratory in Columbia." At Pockoy Island, hundreds of paper bags have been labeled in this systematic way. Inside each paper bag, smaller sealed bags are individually marked to describe contents: remnants of animal bones, shells and pottery. Consistent among the shell ring discoveries, there is a central area that is clean or void of shells. This center of the circle is called the plaza. Archaeologists have pieced together images of what the middle of the doughnut signified or served as. Because few shell remains are found here, it can only be assumed that the space was maintained for ceremonial purposes or protected by some sort of structure. 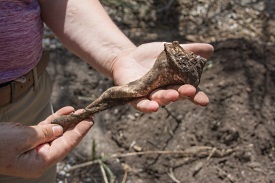 At one of the sifting stations at Pockoy, SCDNR Heritage Trust archaeologist Karen Smith finds a whelk shell that has been shaven or worn down for easy handling. "It could have been used as a tool to pry the oyster shells open," she says. "Somebody has taken the time to remove the outer part of the shell and work it down." For a moment, she surveys the circular vista. "To me, I see this ring as a major shellfish processing site, selecting and processing massive amounts of shellfish. They consumed what they processed and maybe dried and saved food too." She says that most of the excavated bones are the remains of animals that were eaten. Some of the bones were made into tools necessary for everyday life. "But we are also finding animal bone pins and shell beads. They appear to have been making things as well as eating here. All this was happening about 4,400 years ago. We base that on radiocarbon dating. There are similar sites nearby, such as Spanish Mount on Edisto Island State Park and Fig Island shell rings on Botany Bay Heritage Preserve. Both sites date back 4,000 years ago. There also was intensive shellfish collecting at these sites." A Stroll Back in Time: How did we get here? Picking a path through the jungle-like maritime forests of Pockoy Island in Charleston County or Hunting Island in Beaufort County, it's easy to imagine what South Carolina might have looked like before human occupation along the coastal plain. Millions of years ago, towering canopies of cypress, oaks, tupelo, magnolias and palms embraced rich tidal marshlands and estuaries without the interruption of highway systems or neighborhoods, shopping centers or boardwalks. An abundance of stealthy mammals, birdlife, crustaceans and fish populated the brackish ecosystems all the way to sandy shores, layered in seashells. The rumbling of the mighty sea endlessly drummed along the beaches, keeping rhythm for Father Time. With each rolling wave, the Atlantic Ocean continually lured land-dwellers - offering plentiful sustenance and meditation. About 12,000 years ago, some of North America's first human residents navigated toward what we know today as South Carolina. The temperatures in this region were a bit cooler back then, maybe more like the northeastern U.S.
Director of the Native American Studies Center at USC Lancaster Christopher Judge explains in his narratives that Paleo-Indians are thought to have hunted woolly mammoths, giant sloths, mastodons, giant land tortoises and saber-toothed tigers, as well as elk, deer and other smaller game. Well-preserved stone tools and spear points have helped archaeologists depict what life may have been like for them. 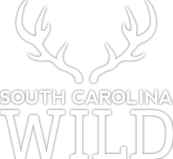 Native Carolinians during the Early Archaic period, between 10,000 and 8,000 years ago, began to use spear-throwing devices to pursue faster game such as white-tailed deer. Based on findings along the Savannah River, these groups of people may have traveled along major river systems as seasons changed. Moving along into the Middle Archaic period, 8,000 to 5,000 years ago, some native groups began to venture away from the major rivers as evidenced by unearthed stone tools and notched spear points. Populations began to increase. Five to three thousand years ago, during the Late Archaic period, tribal societies began to cook food with clay pottery vessels and soapstone cooking stones, which were heated up to boil water. Clay pots were molded and baked into jars and bowls. Vessel surfaces were left plain or decorated with various types of punctations using what was readily available, such as periwinkle shells, at the coast. These ornate artifacts signify the cultural and social development of Late Archaic Native Americans. Bountiful rivers and coastal fisheries drew tribes to settle in these areas during certain seasons. Some coastal villages from this time period left behind circular shell middens containing remnants and artifacts that, today, offer our world a window into the past . . . a snapshot of what life may have been like thousands of years ago. Smith conjures images of possible activities around the shell ring. "Children went out and collected shellfish or supplies and brought them back. And the women and men worked in this group together. "I'm fascinated with decorative styles, whether shell-tool punctations on different pottery vessels, or geometric designs carved into bone pins. Archaeologists can look at changes in style and put them on a timeline. We also can measure social distance by looking at the combination of decorative technique and style." SCDNR archaeologist Sean Taylor walks over to inspect the whelk shell that Smith is holding. On location, he often carves and creates replicas of the unearthed tools that they find to get a sense of the activities that were going on long ago. "Someone went to a lot of trouble to make this blade," he says as he rotates the whelk shell implement in his hands. "They sharpened, smoothed and rounded the edges." Each archaeologist has a different interest in the artifacts that they find at the Pockoy site. "I extract information," Taylor says, "picking up raw material, I figure out how they're made and how they work. On the Savannah River the Native Americans used stone tools. On the coast, they used shells as tools. This is an understudied technology. We don't see rock tools here." There is a narrow passageway leading from the excavation site toward the nearby beach. The afternoon sun is bearing down, and the ocean breeze is welcome. 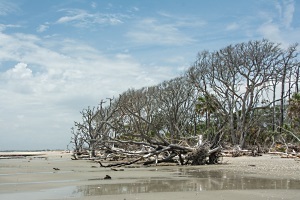 Taylor leads a small group toward a strip of pluff mud in the sand, separating the tree line from the ocean waves. "This shell ring was once further away from the ocean water," he says. "It was on the interior of the island. The pluff mud on the beach is an ancient channel, a buried river that once ran through the marsh. Estuaries ran between the shell ring and the ocean shoreline. The Native Americans most likely traveled by foot and boats to acquire shellfish. They would have probably had boats to load and carry food or supplies - to wherever they would go next." As the shell ring excavation at Pockoy comes to a close, perhaps an even clearer image of our predecessors will begin to form. 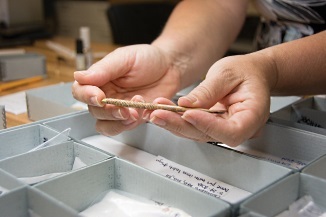 The artifacts are connected through archaeological studies to shed light on how we evolved and where we're heading. Along with partnering groups, the SCDNR houses archaeological finds and discoveries to assemble this ever-evolving timeline. 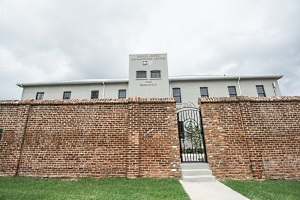 The new Parker Annex Archaeology Center on Barnwell Street in downtown Columbia now serves as home for the SCDNR's Cultural Heritage Trust Program. In the coming years, as field excavations are conducted, volunteers will be offered the opportunity to assist in the field and in the laboratory cleaning, analyzing and cataloging artifacts. 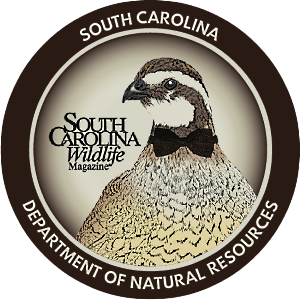 The new facility will be the only one of its kind in South Carolina and will give the public an opportunity to learn more about the state's rich cultural heritage. 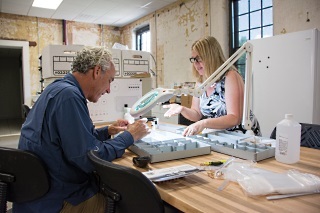 The Parker Annex Archaeology Center is also the first building the program has acquired that will have dedicated office, laboratory, curation and outreach space. The public and educational groups are invited to tour the facility during its open house in January 2019 to view artifacts that evidence human activities through the ages and as far back as 12,000 years ago or more. 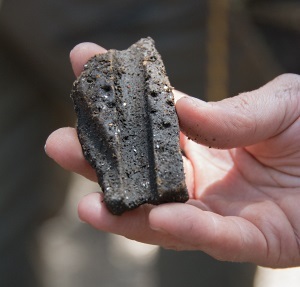 For more information about the SCDNR Heritage Trust Archaeology Program, please visit http://heritagetrust.dnr.sc.gov.